It’s not everyday that a reigning MVP is traded to one of the biggest teams in sports, but that’s exactly what happened to Giancarlo Stanton earlier this week. 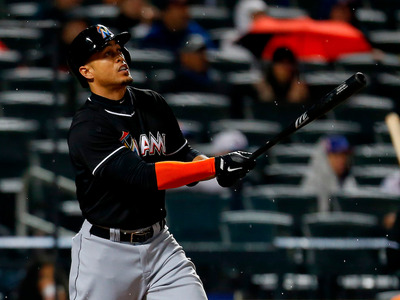 After eight stellar seasons in Miami, the California native was flipped to the New York Yankees in exchange for Starlin Castro and a pair of prospects. With a monster contract worth over $US300 million and a full no-trade clause to work around, the Marlins struggled to gain any kind of leverage and wound up making the deal only after an ugly public negotiation process. Their dilemma will serve as a cautionary tale for the next team that thinks about offering a 13-year contract. But how did Stanton leverage his elite status to engineer a blockbuster deal for the ages, and how did he become the game’s premier power threat in the first place? Below, read all about the 28-year-old’s wild journey to the biggest stage in the game. After a tense standoff that spanned much of the fall, the Marlins finally made their first big move under new owner Derek Jeter. 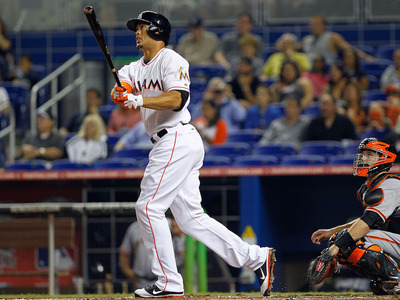 Giancarlo Stanton has been traded to the New York Yankees. 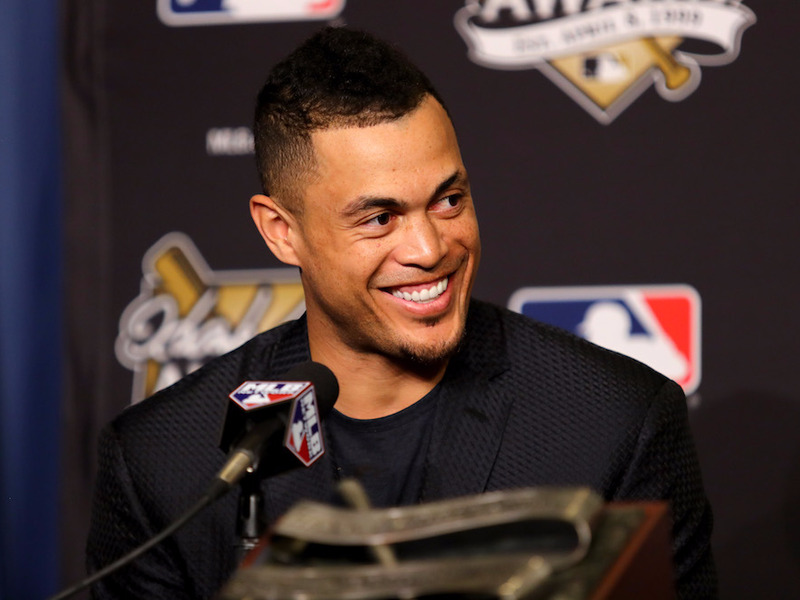 The trade stands out as one of the true blockbusters in MLB history. 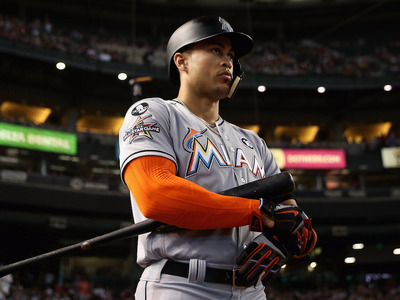 Not only was Stanton coming off a historic 59-home run campaign, he’s also signed to the biggest contract in all of sports: $US325 million over 13 years. 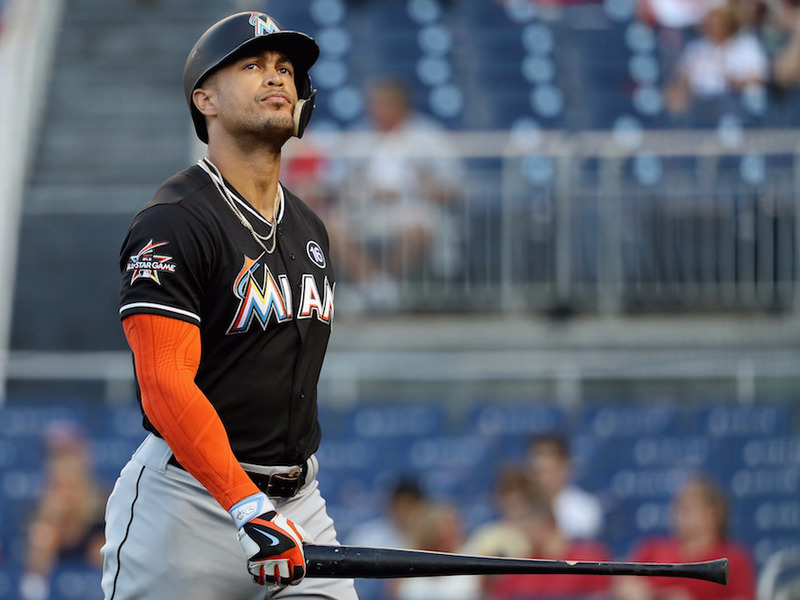 For the cost of just three players, the Yankees will add Stanton to what was already one of MLB’s most dangerous lineups. But just who is the latest superstar to be shipped to the Bronx? 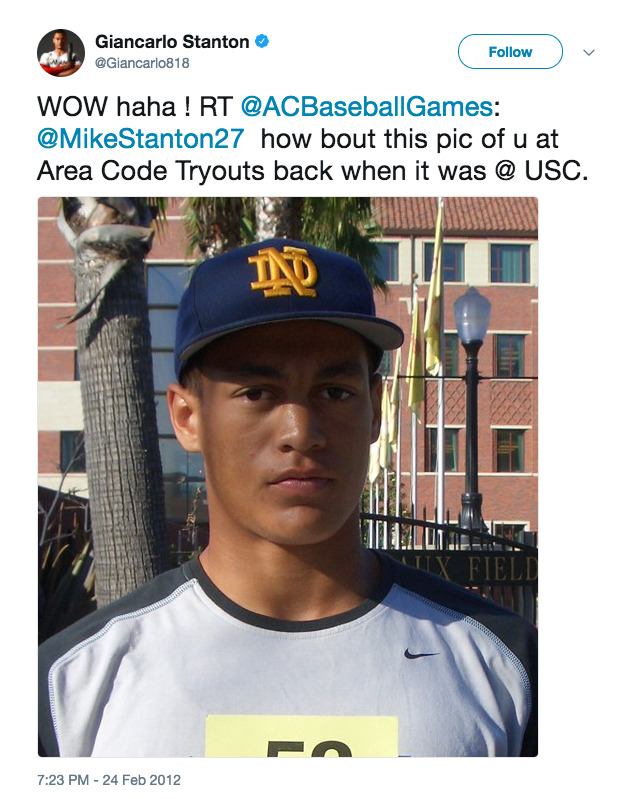 Stanton was born in Los Angeles in November 1989. He had an athletic childhood, lettering in baseball, basketball, and football in high school. Who would've thought this mullet headed kid from Sunland-Tujunga was going to be MVP one day. WOW ! Thank you to everyone who's been in my corner from day 1, & those who kept pushing me all year! It was far from easy, but Damnn did I enjoy the challenge & there is NO kicking back from here…Chasing more dreams???????????? 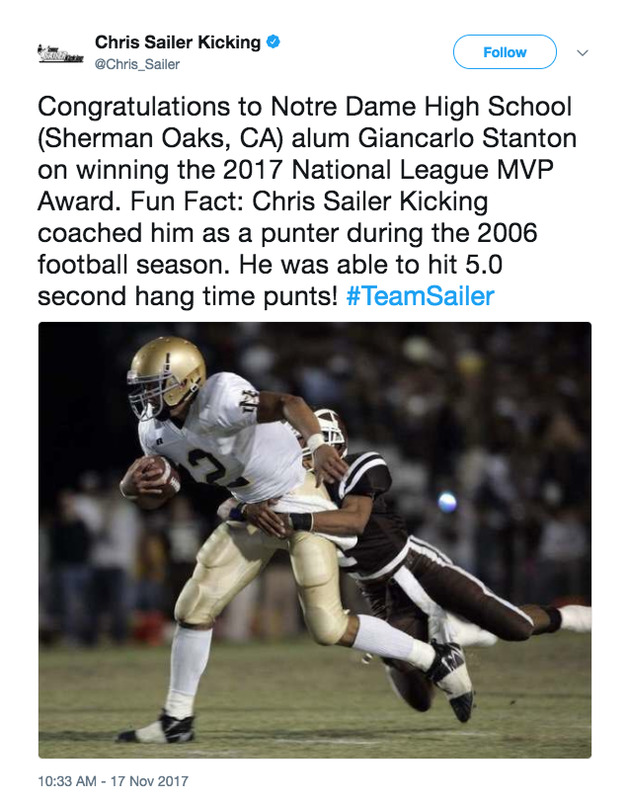 The former Notre Dame High School basketball coach Bill Bedgood said Stanton was impressive from the minute enrolled, grabbing every single rebound in the opening two minutes of his first scrimmage with the team. The young Stanton (who went by his middle name, Mike) was good enough to receive baseball and football scholarship offers from a number of schools, including UCLA, USC, and UNLV. He ultimately chose to play ball for Tulane. But in June 2007, the Florida Marlins took him in the second round of the MLB draft. He decided to forgo college, signing for $US475,000. While he struggled in the 17 games that comprised his first professional season, he put his prodigious power on full display in 2008. He slashed a remarkable .293/.381/.611 for Single-A Greensboro, leading the Sally League in both home runs and total bases. 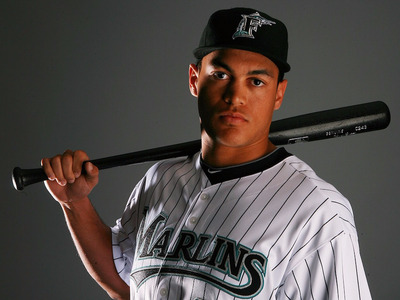 His 2009 season wasn’t as good, but he spent it facing tougher competition, mashing 28 home runs across two levels. 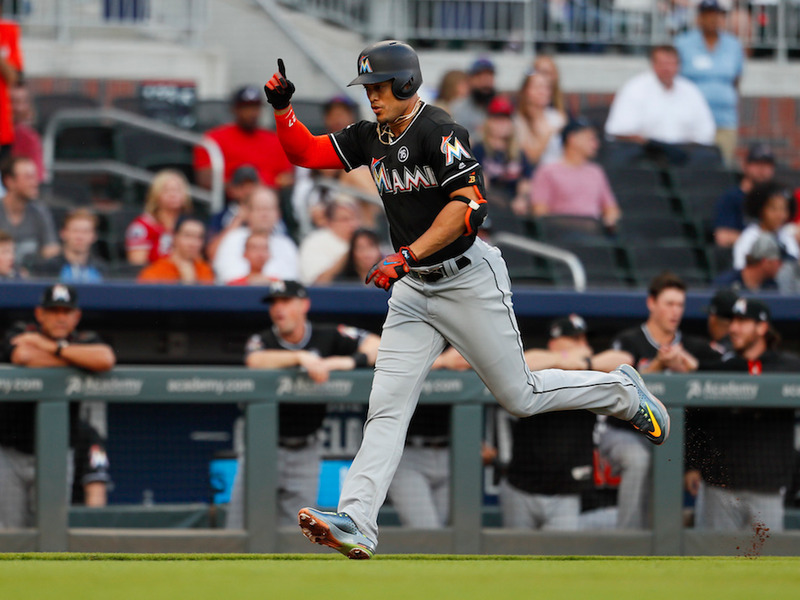 All the while, Stanton was quickly making a name for himself as one of the top prospects in the game. 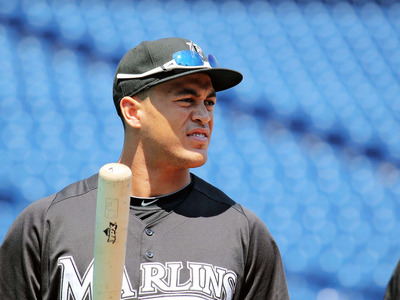 Baseball America ranked him as the nation’s 16th-best prospect heading into 2009, then the third-best prospect ahead of 2010. That was the year Stanton got his first taste of big-league baseball. He made his debut on June 8, quickly gaining a reputation as perhaps the most imposing 20-year-old in the history of the game. He’s currently listed at 6-foot-6, 245 pounds. 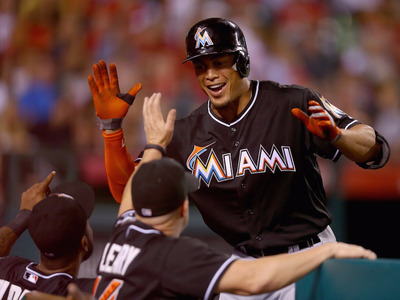 He hit his first home run on June 18, a grand slam off of Matt Garza of the Tampa Bay Rays. It was a sign of things to come. 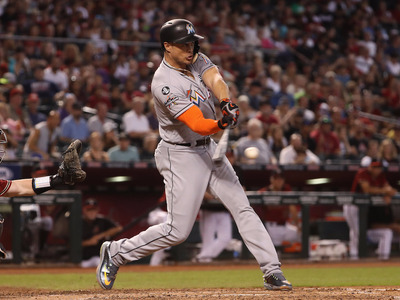 Pitchers were eager to exploit Stanton’s lack of experience, but they couldn’t suppress his enormous power. 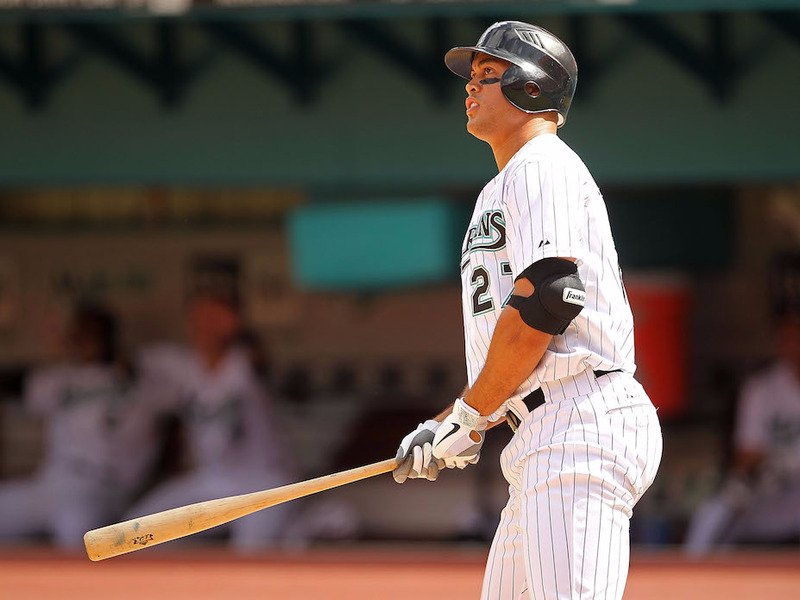 He finished 2010 with 22 home runs and would have received Rookie of the Year support if not for an excellent class in the National League, featuring future stars like Buster Posey and Jason Heyward. The next two seasons saw him cement his status as one of the game’s top power threats. 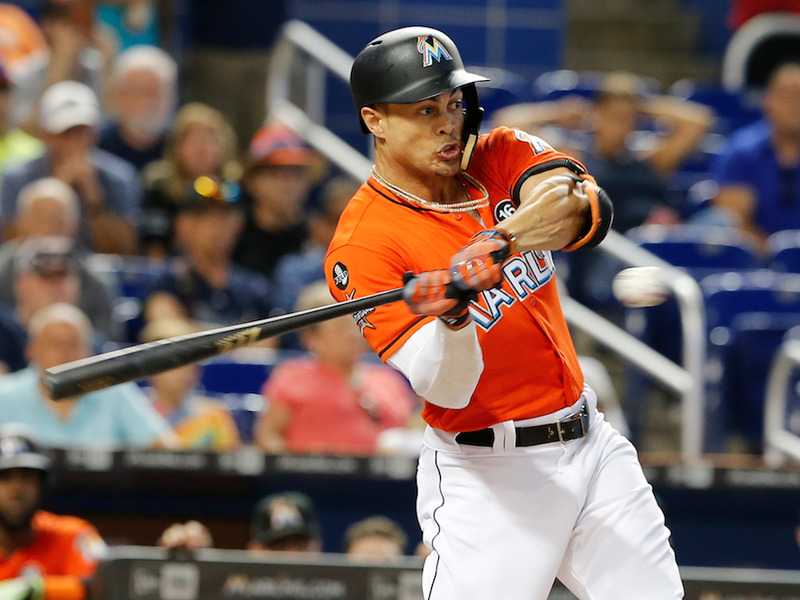 In 2012, he started going by his first name, Giancarlo, then posted a .608 slugging percentage to lead all players with at least 500 plate appearances. And his home runs weren’t just numerous — they were also breathtakingly powerful. In May 2012, he hit dinger that travelled 462 feet and came off the bat at 122.4 mph, the fastest home run since ESPN launched its Home Run Tracker in 2006. 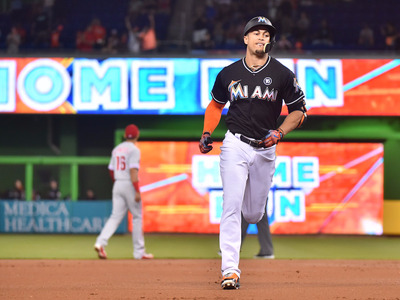 In fact, a quick look at the Home Run Tracker reveals that Stanton’s home runs simply go further and faster than your typical long ball. …as well as a certain amount of physical damage. In 2014, Stanton had his best season yet, slashing .288/.395/.555 while leading the league with 37 home runs. He got more MVP support than any other position player, but lost the award to Clayton Kershaw. 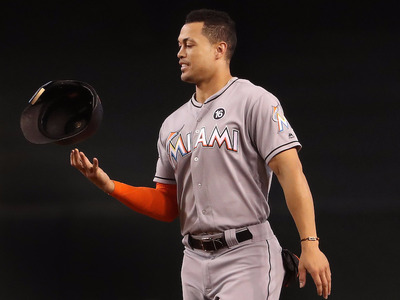 That offseason, the Marlins signed Stanton to the most lucrative deal in the history of sports: 13 years, $US325 million. 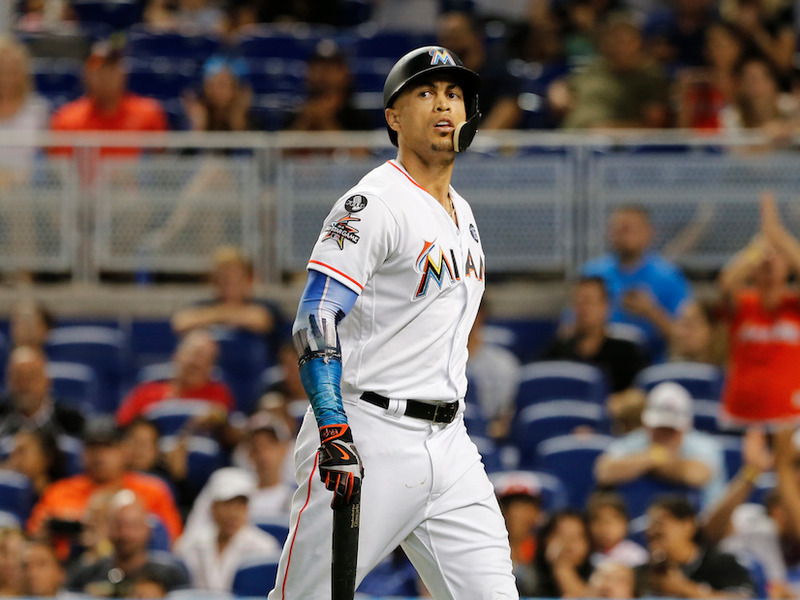 With it, the All-Star gained the freedom to remain in South Beach through age 38, though the deal did include an opt-out clause able to be executed after the 2020 season. 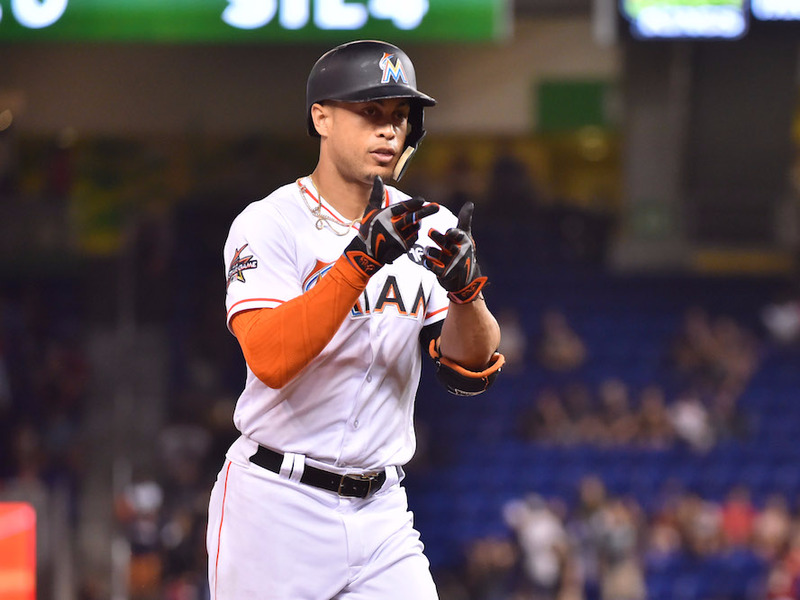 The contract’s value set a new record in the world of sports, but the deal got a relatively positive reception among baseball fans. At last, the often cash-strapped Marlins were making a definitive commitment to a franchise player, something it had not done with past stars like Miguel Cabrera or Hanley Ramirez. Marlins management echoed that statement. 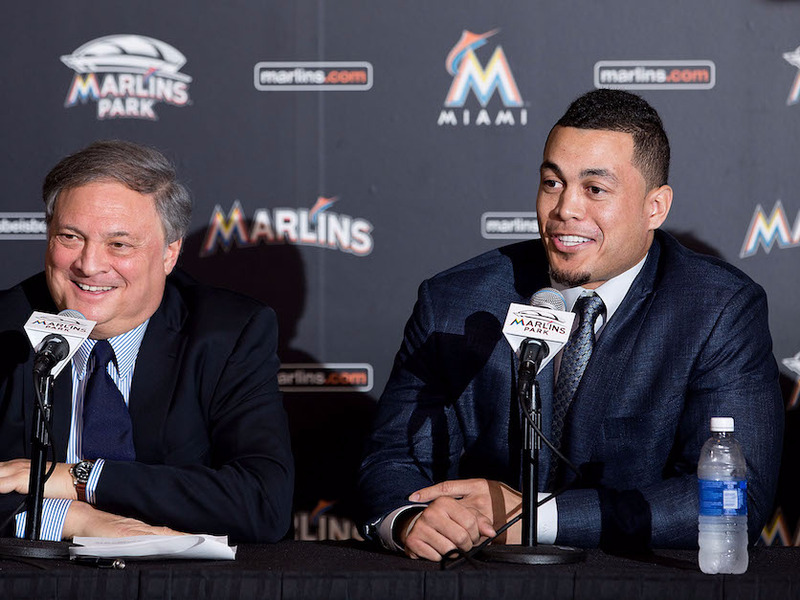 “Giancarlo, the first thing he said was, ‘I want to win and I want to win in Miami,'” said then-team president David Samson. But in 2015, the Marlins got a reality check. They put together a 30-45 record through June 26, the night Stanton broke his hand after being hit by a pitch. Never the most durable player, he missed the rest of the season, and Miami finished 71-91, a six-game slide from the previous year. 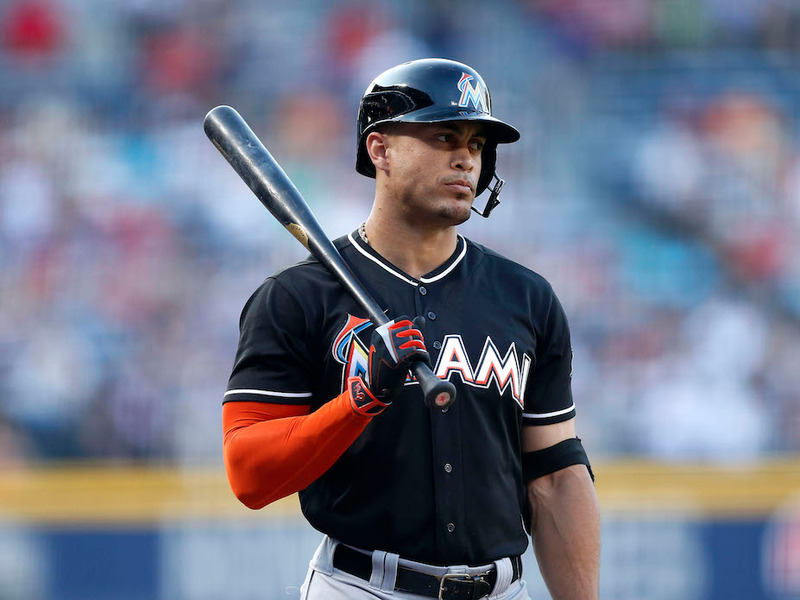 He also missed time in 2016, and he looked diminished when he did play, leading to a .240/.326/.489 slash line. 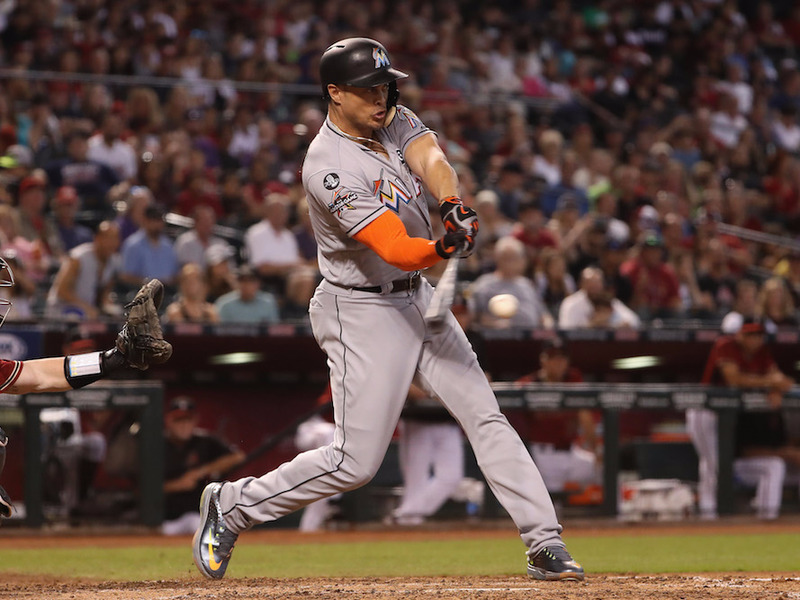 By the end of the season, Stanton had hit just 54 home runs since the start of 2015. His brand as one of the game’s most fearsome home run hitters was damaged. That set the stage for his 2017 campaign, one of the greatest power seasons in baseball history. It began with an impressive but uneventful start to the season: 21 home runs in 81 games. But he caught fire down the stretch, hitting 38 home runs in 78 games to finish the year. 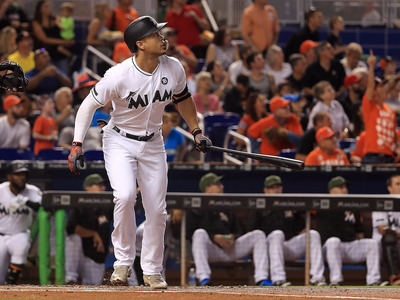 Stanton’s 59 home runs are the closest anyone has come to Barry Bonds’ single-season mark of 73 since the record was set in 2001. Take out players who have been linked to performance-enhancing drugs, and they’re the most since Roger Maris’ 61-homer season in 1961. 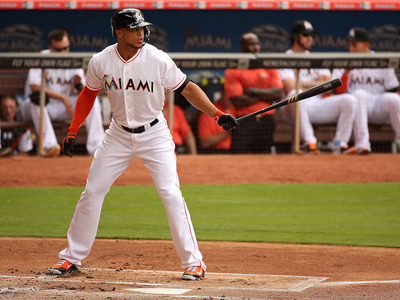 In November, Stanton emerged from another crowded field to win his first MVP Award. He was one of six players to receive at least one first-place vote, edging Joey Votto by just two vote points. 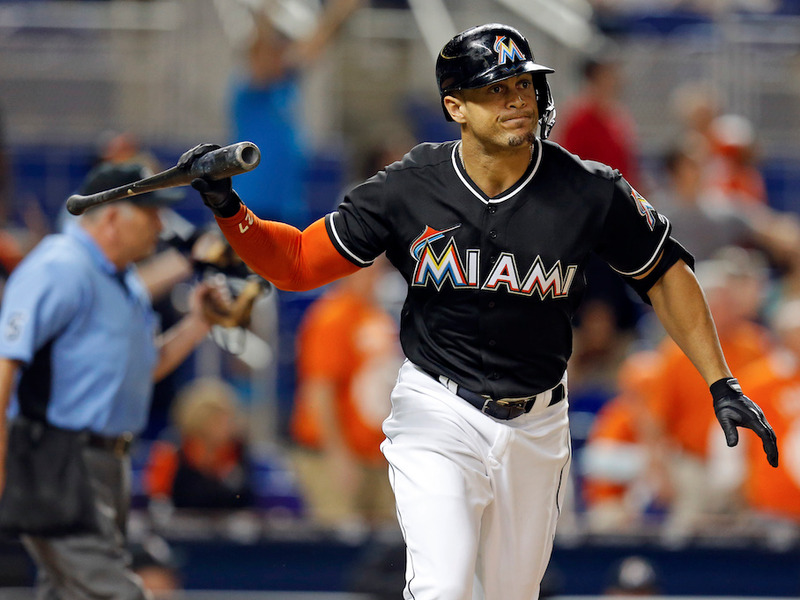 But despite Stanton’s dominance, the Marlins struggled during his tenure. Financial woes were common, as were out-of-nowhere spending sprees and subsequent fire sales. 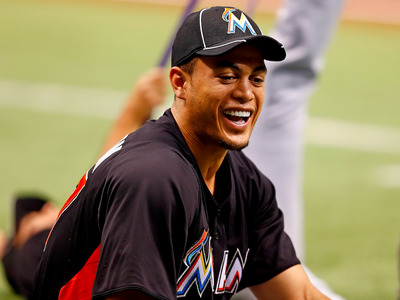 They never had a winning season with Stanton as their right fielder, posting a .453 winning percentage. All of that occurred over a familiar backdrop: discord in the Marlins front office. 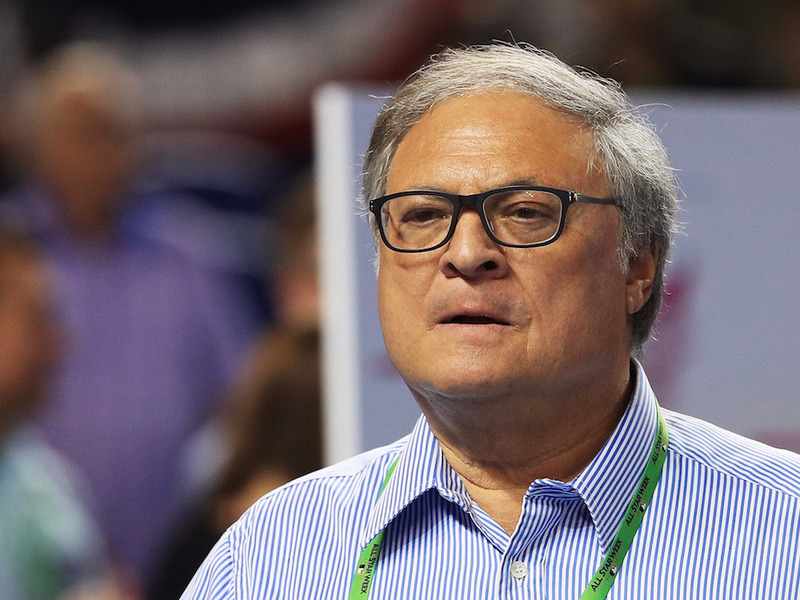 Throughout the 2016-17 offseason, it was widely rumoured that veteran owner Jeffrey Loria had plans to sell the team. Forbes reported that he had a $US1.6 billion offer on the table, though it seems that deal ultimately fell through. 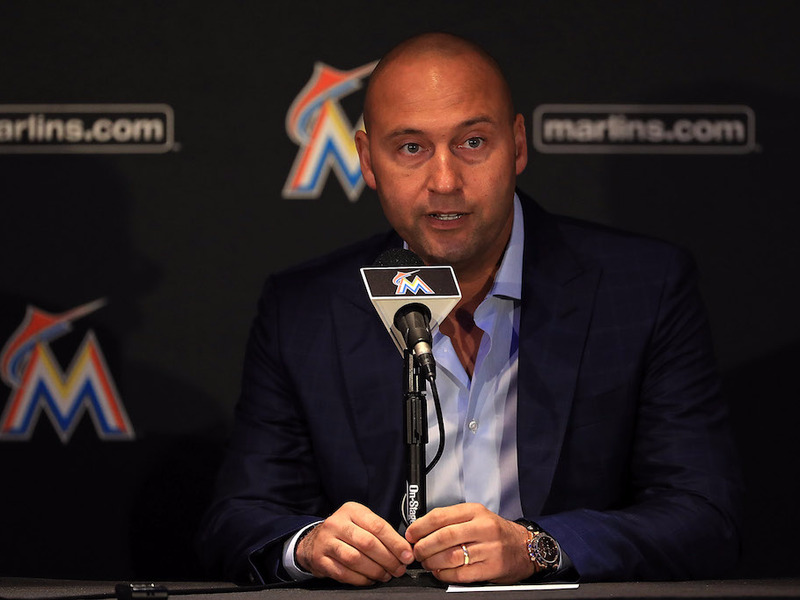 In August, Loria finally struck a deal with the former Yankees shortstop Derek Jeter and the billionaire Bruce Sherman, who bankrolled most of the purchase. 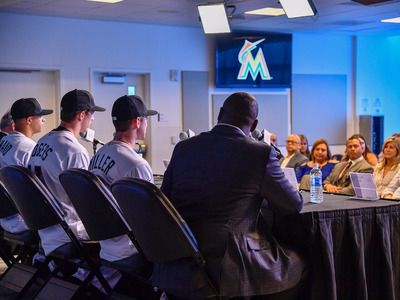 $US1.2 billion changed hands, and suddenly, the Marlins were under new ownership. And that new ownership wasn’t too keen on keeping Stanton around. 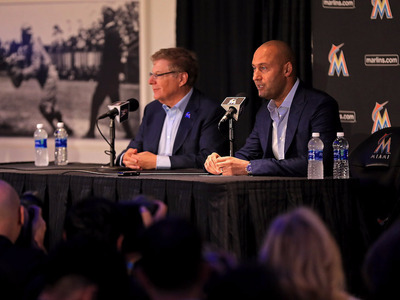 In October, Jeter hinted at a tear-down job when he acknowledged a need to “rebuild the organisation.” The remark came just days after Stanton stated his desire to win in the near term to the veteran reporter Jon Heyman. And just like that, the Stanton sweepstakes were on. Despite his massive contract and full no-trade clause, a number of clubs were linked to the slugger, including the Giants and the Cardinals. But Stanton didn’t want to just go anywhere, and by December, it came out that he had rejected trades that would have sent him to San Francisco and St. Louis. The huge amount of money owed, the full no-trade clause, and the Marlins’ rebuilding plans left Stanton with all the leverage. 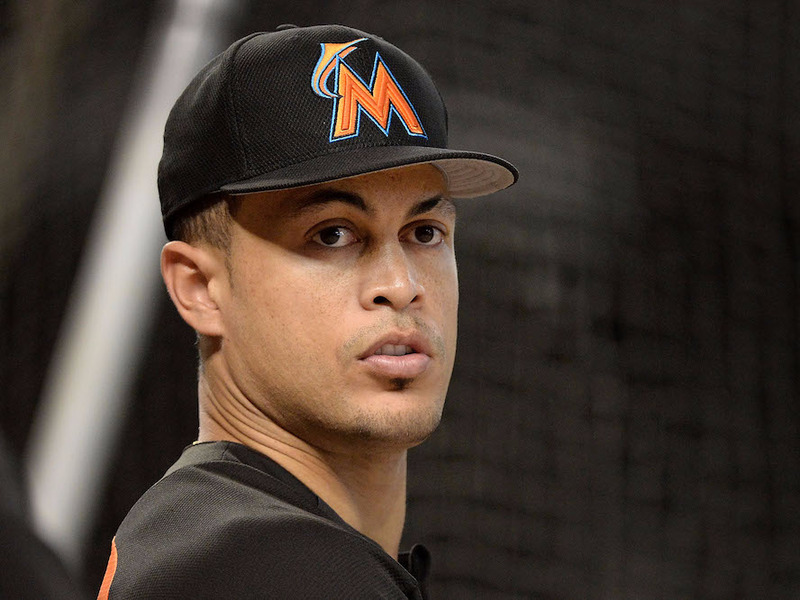 It soon came out that Stanton was willing to accept a move to the Big Apple. 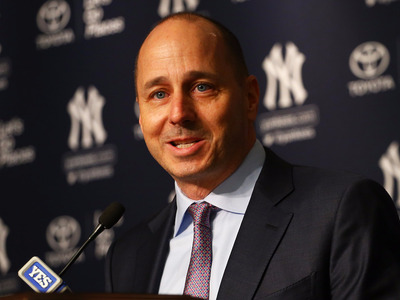 Yankees general manager Brian Cashman made quick work of the negotiations, and within a few days, he had his man. 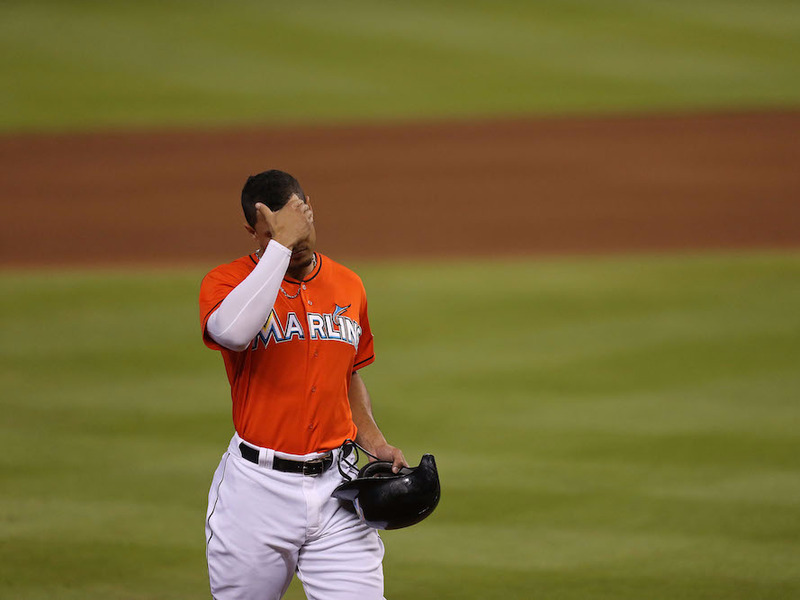 The Yankees sent the infielder Starlin Castro and the prospects Jorge Guzman and Jose Devers to Miami. The baseball world promptly lost its mind. 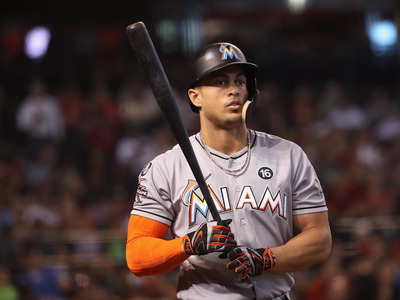 If Stanton became one of the game’s iconic superstars while playing in Miami, one of the lowest-wattage franchises in the league, then imagine how big he’ll be with the Bronx Bombers. The deal was reminiscent of another Yankees blockbuster. 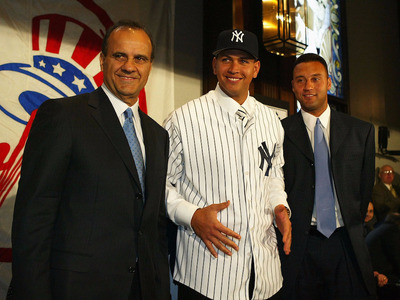 In 2004, they acquired the reigning American League MVP Alex Rodriguez for the relatively light cost of Alfonso Soriano and Joaquin Arias. 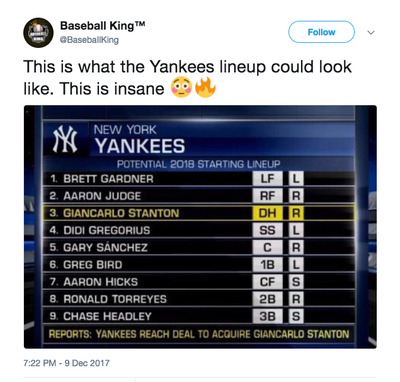 The Yankees ranked second in the majors with 858 runs scored in 2017, and there will be even more offence on the way. Just take a look at a potential lineup for next season — it slots Stanton right between fellow sluggers Aaron Judge and Didi Gregorius. 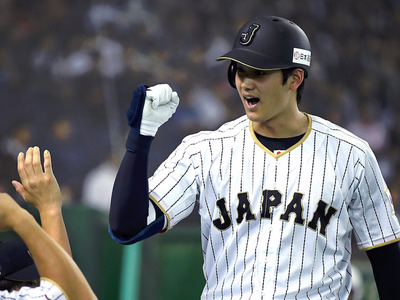 Now check out baseball’s next great sensation.